Jim Al-Khalili (Irak, 1962) physicist, author and broadcaster. PhD in nuclear physics from the University of Surrey (United Kingdom, 1989) is currently Professor of Theoretical Physics and Chair in the Public Engagement in Science at the same institution. He has published more than one hundred papers on nuclear reaction theory, quantum mechanics and quantum biology. He has presented a number of science programs on BBC television and is a frequent commentator about science in other British media. He is also author of a dozen books on history of science and science diffusion. Al-Khalili has received many awards, amongst them, the Medal of the Royal Society Michael Faraday, the Institute of Physics Kelvin, and the Honourable OBE Queen “for his services to Science”. Hans Zimmer (Germany, 1957) German film soundtrack composer, has been a pioneer in the integration of classical and electronic music with traditional orchestral arrangements. Since the 1980s, he has composed music for over 150 films, amongst them, ‘Thelma and Louise’, ‘Gladiator’, ‘The Prince of Egypt’ ‘The Da Vinci Code’, ‘Rain Man’ and ‘The Dark Knight’. Zimmer has been nominated for the Academy Award, ten times; the last one in 2014 (Interstellar, Christopher Nolan), winning in 1994 the aforementioned award for Best Original Score. David E. Kaplan (United States, 1968), Professor of Particle Physics at Johns Hopkins University. He received his PhD from the University of Washington in 1999 and held postdoctoral positions at the University of Chicago/Argonne National Lab and the Stanford Linear Accelerator Center. Kaplan’s research addresses possible extensions to the standard model of particle physics and he spends much of his time either building supersymmetric or other models, coming up with new ideas to explain dark matter, or developing new techniques for discovering physics beyond the standard model. Kaplan has been named an Outstanding Junior Investigator by the Department of Energy, a Kavli Frontiers Fellow of the National Academy of Sciences, and a Alfred P. Sloan Fellow. He has also produced the documentary film, Particle Fever, for which he has won a DuPont Journalism Award, and many other accolades. In his spare time, he hosts the In Theory video for Quanta Magazine. 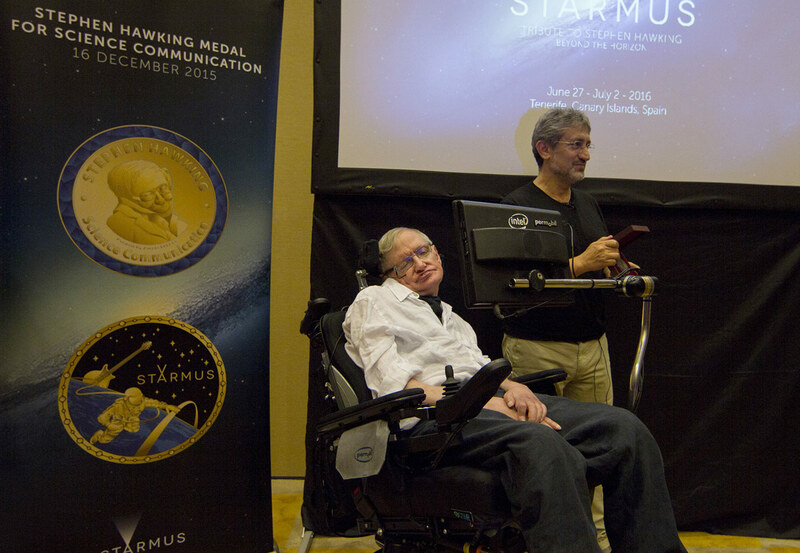 The design of the medal used a portrait of Professor Hawking by cosmonaut Alexei Leonov, the first man to perform a spacewalk and member of the Advisory Council Starmus since its first edition. The other side combines the image of Brian May of the first spacewalk and the iconic guitar – the “Red Special” – to demonstrate music, another major component of the Starmus Festival.